Announcement Welcome to my shop. I am listing new inventory this week and am having a an offer for free domestic shipping for a month on eligible items. I'm working on nesting bowls, bread bowls and large mugs/beer steins and, of course, planters. Stoneware garden sculpture,hanging planters, planters with built in drainage, pie plates, soap dishes, shaving mugs, plates and mugs are on my studio shelves and listed in my shop here. I am always working on planters and am continuing to work on planters for vertical gardening. Planters are a favorite item and gardeners are using them especially for their collections of cacti and succulents. I also love to see geraniums in mine- both scented and rare ones with their spectacular leaf markings. Off the beaten path, I look out my studio window at the surrounding woods. The patterns of the overlapping branches are an inspiration in winter, the shades of green so gorgeous in the spring and summer and the autumn color, of course, spectacular. Horticulturists go back at least four generations in my family and I keep the tradition going in my own way. My web site is virginiawyoming.com. And of general interest Michaela has written a great article on container gardening on her Gardenerseden.com blog. She has featured more pieces recently, also. One of my planter groups was also featured on the Garden Design Magazine Blog. I use stoneware and some earthenware clay and dinnerware safe glazes. Most are one of a kind pieces. Each one even when similar is made by hand separately. CROW SERIES - Sculptures for indoor or outdoor use. I use a special clay for both these series that holds up to winter freezing and thawing as long as objects are not filled with water. I am beginning a new series as most of the crows are already in gardens from Henderson, North Carolina,Baltimore, west to LA and locally in Putney, Vermont. My website is virginiawyoming.com . I would be glad to quote shipping prices to other countries. This has to be done individually and with the Post Office as it is difficult to make estimates. If you live within 30 miles of Putney, Vt. delivery or pickup can be arranged to save postage costs. Welcome to my shop. I am listing new inventory this week and am having a an offer for free domestic shipping for a month on eligible items. Ceramic Teapot Holds Three Cups One of a Kind Glossy Cobalt Blue Glaze over White Stoneware Body One of a Kind. Covered Stoneware Jar with Spring Green Glaze Five Inches High Hand Thrown One of a Kind. Ceramic Hanging Planter in Mat Aqua Glaze Stoneware about Six by Six For Succulents, Herbs or Trailing Plants. Smooth transaction! Very sweet little planter! Beautiful color! This is a lovely little colander! It arrived two business days after I ordered it. I have already been using it and am quite pleased with the quality and look forward to a lifetime of use. There was also an extra wee gift included that was awfully sweet. Thank you! Excellent pottery, just as described. Well made. Art sustains me, especially the creation of useful, artful objects. Clay is my main medium but I have worked with pastel painting and drawing as well as collage keeping a thread of all of them ongoing. I began to take ceramics seriously at Rutgers working with the late Hui Ka Kuong who was inspiring and kind. 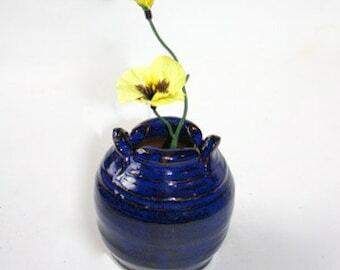 I started out in sculpture primarily but later my work moved toward the utilitarian and became also more related to horticulture with planters, pots and vases. I am influenced by historical pottery, the environment, the nature of my Vermont habitat and the wealth of art and craft in this area. After studying art at the University of Illinois I I studied with Hui Ka Kuong at Rutgers receiving an MFA. I've been working at this present Vermont wooded location since l976. of its handcrafted origin and contribute to the uniqueness of each piece. I want you to be happy with your purchase. Please contact me within two weeks if there are any problems. I will be happy to make a refund for the item or exchange if you wish to return a piece at that time. You would be responsible for shipping costs. For Vermont customers we are required to collect a 6% tax. Commissions need to be paid for in advance. I send all packages with delivery confirmation. Usually I send Priority Mail unless there is a marked difference from parcel post because shipping costs differ across the U.S. You may get a refund or be billed if there is more than a $2.00 difference in what I estimate and what you pay. I use recycled packing materials whenever possible. I would be glad to get an estimate for international shipping for you. Let me know as soon as possible if there is breakage as insurance comes with priority mailing. I can make custom orders . Inquire about wholesale.